Casper Darare is a South African of Shona descent. At an early age he developed a keen interest in stone carving and was nine years old when he began working as a washer/polisher for a local carver. On leaving school, Casper worked and studied under the renowned mute Shona Sculptor, Shadu Chatsamer, quickly establishing himself as one of Southern Africa's best known representational sculptors. Working originally in Verdite, Casper became the first sculptor to use Africastone which is know as the marble of Africa. Africastone is a beautiful and mysterious stone of rare quality; infinite in its variety of shades ranging from pearly gray to dark black and many shades of red. The stone is a unique deposit of metamorphosed clay. When the world was new and the ever changing surface was subjected to intense heat and raging storms, the lava's of the dominion reef system attracted this sedimentary deposit. The only know deposits are in the Transvaal where the richest gold mines are located. 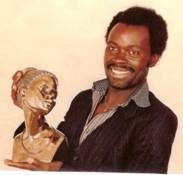 Since the early 1970's, Casper's work has been exhibited in major Southern African galleries and he has collected an award as South Africa's best Sculptor. His strength lies in his amazing ability to create human figures of great expression, sensitivity, mood and beauty. Casper passed away in June 2001 after a short illness.